The Asking Formula mobile solution, the ASK U app, reinforces workshop learning and leverages innovative technology. 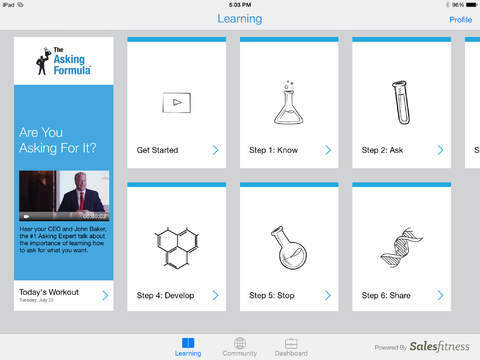 SAINT PAUL, MN (September 2, 2014) – Available today, “The Asking Formula” mobile solution, “ASK U,” is available in the App StoreSM on iTunes®, exclusively for the iPad®. “ASK U” applies the latest principles in learning, online gaming and corporate competitive spirit. 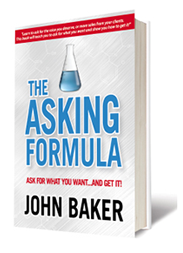 “The Asking Formula” is an award-winning book and workshop by author and speaker John Baker. It presents a proven and high-impact process for structuring a best-in-class “ask,” regardless of audience, topic or situation. Baker’s workshops are highly ranked with entrepreneurs, business leaders, Fortune 500 sales teams and the U.S. Department of Defense. “ASK U,” powered by SalesFitness, is part of an enterprise packaged solution that presents “The Asking Formula” as a simple and effective mobile application. It is an interactive training and practice tool that has revolutionized learning and retention, especially for companies with a geographic diverse workforce or groups who are required to travel. Users learn ongoing lessons from John Baker through video and online events, practice and share their asking behaviors through iPad video technology, receive helpful motivation from their peers and earn achievements from their manager. Companies can customize “ASK U” to tailor the app to a specific initiative, product launch or sales process. “Taking ‘The Asking Formula’ through this evolution from concept, to book, to workshop and now a mobile solution has been tremendously satisfying because we see the immediate impact to people who want to advance their professionalism and improve their communications skills,” said Baker. “ASK U” is currently an enterprise only mobile sales and product training solution. A consumer version of the app is in development and will be available at a future date. 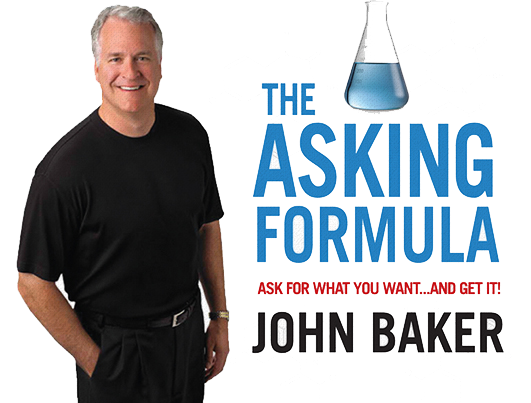 Baker has shared his methodology outlined in “The Asking Formula” through programs and keynote addresses across the United States, in Europe, Australia, China and Singapore. Participants learn and practice a six-step repeatable process they can apply in professional and personal situations to “ask for what they want… and get it.” Baker’s humor, expertise and coaching style create an entertaining learning environment. Learn more about “The Asking Formula” in this video. See ASK U in the iTunes store. Register to receive ASK U information and updates by email. SalesFitnessTM is a scenario-based, mobile, e-learning platform for sales and product training. 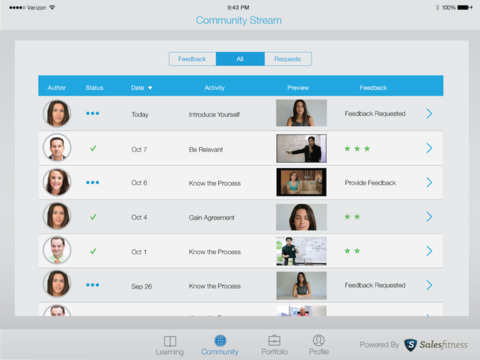 The cloud-based system uses mobile technology, asynchronous two-way video, a social learning feedback system, and a unique “gamified” motivation system. Users access expert training content and use the camera on their device to practice skills and request feedback from peers, a coach, or a manager to improve performance. Learn more at salesfitness.net. Leave a reply / This entry was posted on September 2, 2014 by .